The high burden of deafness globally and in India is largely preventable and avoidable. Studies say that in India, 63 million people (6.3%) suffer from significant auditory loss. Disability surveys conducted nationwide have estimated hearing loss to be the second most common cause of disability. There are various reasons why hearing loss occurs. Some of them are common with ageing (presbycusis) usually beginning around the age of 55 and increasing in the older age group over 65 and above, to almost one in every two people. However there are other reasons for hearing loss such due to noise, ear infections, genetic predisposition, illness etc. Conductive Hearing Loss - Conductive Hearing Loss occurs when there is a problem with the Outer or Middle Ear which interferes with passing the sound to the Inner Ear. Surgery and some types of hearing technologies such as Bone Conduction Hearing Aids, Bone Anchored Hearing Devices and Middle Ear Implants can help with the treatment. Sensorineural Hearing Loss - occurs when the hearing organ, the Cochlea, and/or the auditory nerve is damaged or malfunctions, like the disability to accurately send the electrical information to the brain. Sensorineural Hearing Loss is permanent. The solution is Hearing Aids or Cochlear Implants based on the individual condition. Mixed Hearing Loss - occurs when both Conductive Hearing Loss and Sensorineural Hearing Loss are present. The sensorineural component is permanent, and the other temporary. The treatment involves medication or surgery to control the hearing loss of conductive origin. This is followed by hearing restoration through hearing aids for the sensorineural component. Central Auditory Processing Disorders - occurs when the brain has problems processing the information contained in sound, such as understanding speech and where the sounds are coming from. Physical exam - to check for earwax, infection or any structural causes of your hearing problems. General screening tests - to test how you respond to sounds with one ear and both ears. Tuning fork tests - Tuning fork evaluation may reveal whether hearing loss is caused by damage to middle ear, to sensors or nerves of your inner ear, or damage to both. Audiometer tests - These are thorough tests conducted by an audiologist presenting a range of sounds and determines your ability to hear. The results of hearing tests can be deciphered on an audiogram (chart) in decibels (dBHL) for both ears (bilateral) or for each ear individually (unilateral). Hearing loss can be ranked as mild, moderate, severe or profound. Some of it can be successfully treated (depending on the cause) with medicine or surgery, while sometimes it's irreversible. This does not mean you have to live in a muted world. You and your doctor can take steps to improve your hearing. Clearing blockage of ear wax: Earwax blockage is a reversible cause of hearing loss which can be removed by loosening of wax and then flushed, scooped, or suctioned out. Surgical procedures: Surgery is preferred in the case of a traumatic ear injury or repeated infections, to drain out the ear by inserting small tubes. Hearing aids: When the inner ear is damaged, a hearing aid is advised to make it easier for you to hear. A hearing aid amplifies sound and directs it into your ear canal. Discuss the benefits of using a hearing aid, and follow the treatment plan advised by your ENT specialist. Cochlear Implants: may be the best option for you if the hear loss is severe. A cochlear implant is a small, complex electronic device that can help to provide a sense of sound to a person who is profoundly deaf or severely hard-of-hearing. A cochlear implant bypasses damaged hair cells of the cochlea, which is the actual reason of nerve deafness, and compensates for the damaged inner ear. Without a Cochlear Implant, the damaged hair cells of the cochlea can prevent sound from normally reaching the brain, even with the most powerful hearing aids. If you're considering a cochlear implant, discuss the risks and benefits with our ENT specialist. For more information regarding Cochlear Implants click on the link. Why Choose BSR for Hearing Loss? BSR ENT Hospital is one of the renowned ENT Specialist Hospital in Hyderabad with a high success rate of surgeries and clinical outcomes since the past 40 years. Trained and Experienced Doctors: Highly qualified, experienced and trained ENT specialists like Dr. B. Shanker Rao, MS, DLO, FICS and Dr. B. Kalyan Chakravarthy, MS ENT / Head and Neck Surgeon, are adept at delivering the best in treatment solutions for all ENT disorders. Dr. Kalyan Chakravarthy is also a consultant with KIMS Hospitals, one of the largest corporate Hospitals group in South India with tertiary and quaternary healthcare. 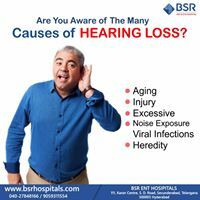 Latest Technologies and Equipment: BSR applies latest technologies for ear disorders/ hear loss such as Cochlear Implants, BAHA (Bone Anchored Hearing Aids), Middle Ear Transducers (MET), Zeiss Microscope, Lasers, Clinical and Biochemical Laboratory / Radiology and has its own otoneuro clinic. Patient Centric Approach: They are supported by a team of expert specialists who ensure every patient gets the treatment they deserve with utmost care and compassion. The high quality treatment is personalized and affordable. The doctor discusses the treatment plan with the patient and educates them on the condition and treatment to help the patient be aware of his/her condition and the treatment process. Emergency Care and Appointments: The Hospital has emergency care and consultations that are available on appointments and just a call away.